A new Spanish language edition of Houdini's 1920 book, Miracle Mongers and Their Methods, has been published by Nórdica Libros. The book is translated by Alicia Frieyro and contains illustrations by Iban Barrenetxea. 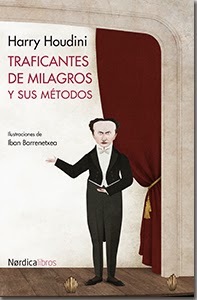 Traficantes de milagros y sus métodos was officially released yesterday, Houdini's birthday, and is available now via Amazon.es (Spain), Amazon.com (U.S.), Amazon.co.uk (UK) or The Book Depository (which offers free shipping worldwide). Below is a nice promotional video for the book from the Nórdica Libros website. I think these illustrations by Barrenetxea makes this one a must buy. Thanks to Arthur Moses (who else) for the alert. Thanks Eduardo. Yep, covered that one when it was released last year. Maybe we'll see more Spanish language HH books released?